Muscle cramps affect athletes of all ages, sizes, shapes, and experience levels, yet the exact cause of muscle cramps is still not fully understood. In the past decade, sports science has revealed information that challenges long-held beliefs and offers new hope for kids who are prone to cramps. If you still believe muscle cramps are caused by dehydration and electrolyte imbalances, we have some important news for you. Sports scientists have long been searching for the “magic bullet” that will put an end to muscle cramps, and the more they learn the more likely it seems that cramps are caused by a number of inter-related factors rather than a single cause. Several studies throughout the 2000s showed no significant differences in the electrolyte levels and hydration statuses of athletes who cramped and those who didn’t (3, 4, 5). Some severely dehydrated athletes don’t cramp, and some well-hydrated athletes do. Some athletes with normal or high levels of electrolytes in the blood still cramp, whereas athletes with low electrolyte concentrations sometimes don’t cramp. Another criticism of the hydration/electrolyte theory of cramping was the fact that exercise-induced muscle cramps are almost always isolated to working muscles. Dehydration and electrolyte imbalances are systemic, and when muscle cramping occurs in a medical setting, patients suffer cramps throughout the body. So, if cramping isn’t caused by dehydration/electrolyte imbalance alone, what else plays a role? A better way to think about muscle cramping is as a disruption in the communication between your nervous system and muscles. To use your muscles, your brain sends signals to contract down the spine and out to muscles through alpha motor neurons, and then muscles use something called the Golgi Tendon Organ (GTO) to inhibit contraction and let muscles relax. Under normal circumstances these signals are in balance and contractions are followed by relaxation. When communication breaks down, which can be caused by different combinations of factors, the ‘contract! -contract! -contract!’ signals can become overactive, and the inhibition from the GTO diminishes. The balance tips toward more contraction and less relaxation, and you end up with a flexed muscle that just won’t let go. 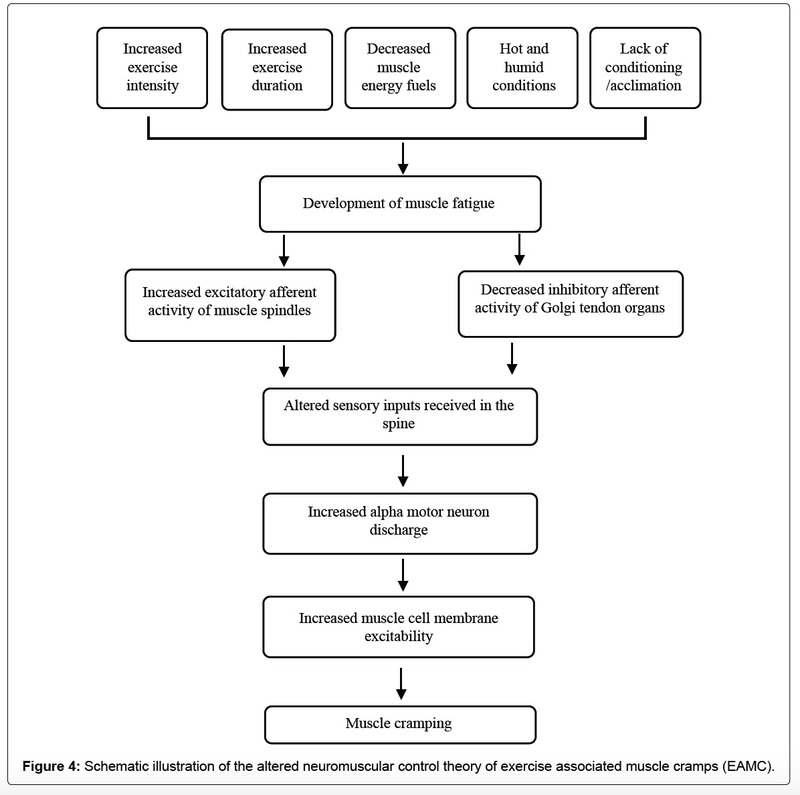 The schematic below illustrates how the neuromuscular theory of cramping might work. Multiple variables affect muscular fatigue and lead to an imbalance in communication between your muscle spindles and GTOs. This can cause incorrect information to be received by your nervous system (alpha motor neurons) and lead to extra messages to contract winning out and a muscle cramp occurring. Image from Qiu J, Kang J (2017) (3). As interesting as the science of cramping is, parents want to know how to prevent their kids from suffering from cramps and how to make them go away when they happen. Based on current research into exercise-induced muscle cramps, recommendations fall into three categories: training, nutrition (food/fluids), and strong sensory stimuli. In a lab you can induce a muscle cramp by stimulating a muscle to contract over and over again for a prolonged period of time. Eventually, the muscle fatigues to the point neuromuscular control gets out of balance, and Whammo! – your muscle cramps. In real life, a young athlete’s chances of experiencing a muscle cramp increase when they are undertrained or new to a specific sport – when exercise intensity increases significantly in a sport they are accustomed to, and/or when exercise duration is longer than they are accustomed to. A year-round combination of generalized fitness and sport-specific training can reduce the chances of muscle cramps in young athletes. Staying active helps ensure kids’ muscles are ready for new challenges, whether that’s a new activity, more intensity, or longer practices/competitions. This is yet another argument against having kids specialize in a particular sport too early. While dehydration and electrolyte imbalances may not be the sole causes of exercise-induced muscle cramps, they certainly make a young athlete more susceptible! Heat and humidity also play a role, specifically because they exacerbate dehydration and the loss of electrolytes through sweat, and young athletes are at greater risk for overheating because they generate a ton of body heat but have relatively little skin surface area available for sweating. Keeping kids hydrated removes or minimizes one factor that can contribute to cramping, and consuming electrolyte-rich drinks during hot-weather practices and games can help minimize the chances of excessive electrolyte loss. Food also plays a role in preventing cramps, not only because foods can be a great source of electrolytes, but also because carbohydrate energy helps stave off muscular fatigue. Strong tastes are the newest (and coolest) development in preventing and treating cramps. You know those athletes who swear by pickle juice or spicy foods/drinks as a means of preventing cramps? For a long time, people thought they were effective because they were high in sodium, but science has shown the effect happens faster than sodium can be absorbed and affect the body’s sodium concentration. A 2010 study by Kevin Miller, sometimes referred to as “The Pickle Juice Study,” concluded the strong/bitter taste of pickle juice stimulated sensors in the mouth and throat called transient receptor potential (TRP) channels (1). TRP channels throughout the body mediate a various stimuli, from pain and pressure to heat and cold, and help the nervous system figure out what to do next. Remember those over-excited ‘contract! -contract! -contract!’ nerve impulses that throw the action-relaxation balance out of whack and lead to a muscle cramp? Well, Miller and his colleagues found that strongly simulating TRP channels in the mouth and throat with spicy/bitter/vinegary tastes (not just pickle juice) can calm those overexcited nerves. This reduces the chances muscles will cramp and shortens the duration of a muscle cramp that’s already happening! When it comes to cramping, it’s often said there are only two types of athletes: those who have cramped and those who will. Currently, there doesn’t appear to be a foolproof way to prevent your young athlete from experiencing a muscle cramp, but it’s just as important to realize there’s more you can do than just making sure your kids are well-hydrated. PreviousPrevious post:Warning Signs Your Teen Athlete is Abusing SteroidsNextNext post:Kids and Carbonation: Is Sparkling Water Good for Youth Athletes?